Chihuahua Dogs - The Chihuahua is a small breed of dog in the toy classification originating from Mexico. Chihuahuas are best known for their small size, large eyes, and large, erect ears. 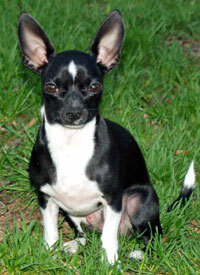 The AKC (American Kennel Club) recognizes two varieties of Chihuahua, the long-coat and the smooth-coat. Many long-coat Chihuahuas have very thin hair, while other long coats are very dense and thick . Chihhua colors can get complicated due to the vast number of possibilities. Examples would be a Blue Brindle or a Chocolate and Tan. Colors and patterns can combine and affect each other for an almost infinite rainbow of possibilities. That said, the classic Chihuahua color remains Fawn. No color or pattern is considered rare or more valuable than the others, it is all just a matter of personal preference. Chihuahuas are prized for their devotion, ferocity and personality. Their curious nature and small size make them easily adaptable to a variety of environments, including the city and small apartments. Chihuahuas are often stereotyped as high-strung, though it has been shown that correct training and socialization can result in an outstanding companion animal. Chihuahuas are not well-suited as small children's pets because of their size, temperament and tendency to bite when frightened. It is recommended that children be 12 years or older before adding a chihuahua to one's home. Also, many Chihuahuas focus their devotion on one person, becoming overly jealous of that person's human relationships. This can be mitigated through socialization. Chihuahuas also tend to have a "clannish" nature, often preferring the companionship of other Chihuahuas over other dogs. This information is licensed under the GNU Free Documentation License. It uses material from the Chihuahua article on Wikipedia.org. Chihuahua Breeders - Advertise your kennel puppies and dogs here. Daisy Lane Chihuahuas - California - AKC Registered Chihuahuas. Smooth coat and long hair. Most colors avaliable. Redwood Mountain Chihuahua - California - We are located 3 hours North of San Fransisco, CA on Hwy 101. AKC compliant breeder of fine, healthy pups. Always striving for show quality, excellent, housebroken companion pets. Guaranteed happy with a buy back clause.